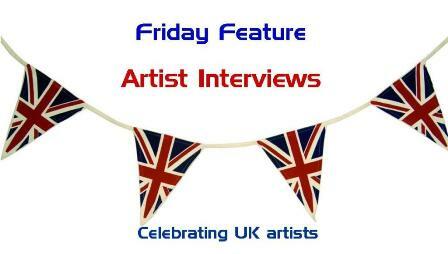 Welcome to the second weekly interview celebrating the talents of British artists in the field of scrapbooking, photography, mixed-media, art journaling, feltmaking and quilting. Some names you may know and some may not be so familiar but they are all hugely talented. This week we welcome Julie Kirk. I’m a blogger, freelance magazine contributor and the one-woman kit creator, product-photographer, branding-designer and marketing manager behind an Etsy shop selling vintage paper packs and creative supplies. I share a house and a life in the North East of England with a small mound of ephemera, shelves full of vintage ‘treasures’, a wardrobe full of patterned clothes and a man who doesn’t mind any of it. I love the work of writer and artist Graham Rawle. He’s so inventive and creative and uses collage to great effect particularly in his book Woman’s World which is a full length novel pieced together solely from snippets of women’s magazines from the 60s. In fact, I admire many artists who use ‘found’ materials in their work as I find my biggest inspirations from non-traditional crafting supplies too. In this group I’d include the assemblage artist Joseph Cornell along with current artists such as Susanna Scott and Katie Licht. I enjoy the work of Austin Kleon whose ‘Blackout Poetry’ is created by blacking out unnecessary words on a page to reveal the hidden poetry within. And comic strip artists and illustrators like Berger & Wyse and Marc Johns always make me smile too. I feel humour is an important element in art … which perhaps get overlooked in favour of more serious aspirations. Oh and I’m a complete colour-addict with a huge fondness for the abstract colour work of Paul Klee and Mark Rothko. Finally, I also believe my late Grandma has had an influence on me somewhere down the line because while she was not at all artistic she cherished the weird and wonderful, the shiny, the unusual, the colourful and she is almost certainly responsible for my ability to see the treasure in other people’s trash! Now I’ve written this out I see there’s definitely a few threads drawing all of these figures together: boldness of colour, use of found items, discovery of found phrases and the importance of the quirky and humorous … and suddenly I see their influences looming very large! Whether it’s scrapbooking, collage, art journaling or cardmaking, it all starts and ends with paper for me. I think it’s because it holds so many possibilities in one easy to acquire, easy to store , lightweight sheet! Plus, it’s neat, tidy, you can’t really spill it and ruin your clothes and, if you get tired of it, you can throw it into the recycling and still feel virtuous! I’m a jack of all crafts really, there’s not much I won’t or indeed haven’t tried out [except crochet, which I hid from when a friend tried to teach me!]. But more recently, when not paper crafting, my creativity has been funnelled into blogging which I find a hugely creative activity. Not only am I creating [hopefully] interesting online content but I’m also creating myself, my own virtual presence, with every post. I’m presenting to the world the ‘me’ I want other people to know, and in doing so, through mining my experiences to create informative classes and posts, through questioning myself, discovering my opinions so I can then write about them and through telling stories about my life on a regular basis not only have I constructed an outer me … I’ve learned so much about the inner me at the same time. Blogging has been a truly fascinating, rewarding and indeed – creative - experience for me. I remember being drawn to specific coloured crayons in school. Colours that we didn’t have at home … in fact I still remember they were a peachy shade and a cornflower blue. This must have been before my sister and I got a Crayola Carousel, because after that we didn’t covet another colour crayon again! From the outside, I guess my transition might have appeared rather precarious. When I left school I was accepted into art college but then experienced a period of depression which meant I couldn’t attend. But, fortunately, during my recovery, my creativity didn’t leave me and I spent my time cross-stitching, patch-working, drawing and writing. When I did return to education I changed routes and followed my love of words taking an English degree instead. Fortunately I’m at a point in my life where I get to combine my mutual loves of creativity in art and in writing … which is more than I could ever have hoped for. I made a lot of things … which isn’t meant to sound flippant at all. It’s just that when you first begin making something, you’re inevitably influenced by an artist whose work you’ve seen already, perhaps which led you do take up the activity in the first place. But then, the more you make, the more diluted those other influences become and lo and behold … the one and only ‘you’ comes out the other side. More concentrated. Yes, let’s go with diamonds instead! Whatever else I’ve taken on board and digested, I’ve now arrived at this [diamond-like?] core of word snippety, colour splashing, print combining, phrase finding creativity which is seemingly ‘me’. I either just surround myself with some supplies, sift through them casually, cut things out and move things around until something fits. No pressure. Just find something I like and stick it down. I back away entirely. I don’t force it. I go and do something else entirely. For as long as it takes. That said … if it’s not a personal project I’m working on, if I’m working to a deadline … then that’s a jumpstart enough and I just get on with it! I adore the Yorkshire Sculpture park, both its outdoor displays and galleries are always so inspiring, and I try to visit once a year and usually take photos at every single step! But I also love my local gallery, the MIMA in Middlesbrough for its architecture and its peace and quiet in the centre of town. I’m going to have to give you more than one I’m afraid so let’s go with Ingenious Pain by Andrew Miller, Wolf Hall by Hilary Mantel, When You Are Engulfed in Flames by David Sedaris and can I sneak Shakespeare’s Hamlet in there too please? If you were able to ask Julie anything what would you ask? Please add your question to the comments below. See you next Friday for an interview with Kate Crane. Firstly - thank you so much Bernice for asking me to take part in your series - it was great to take time and think over your searching questions! And ... if I'm allowed to answer Carolyn ... I get my vintage books from anywhere and everywhere. Mainly charity shops, but second hand book shops, car boot sales ... my parents' cupboards. Anywhere I spot papery treasure!